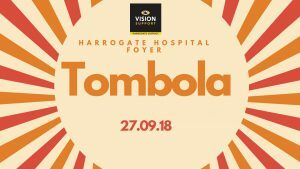 Tombola @ Harrogate Hospital – Thursday 27th September. Beryl Wood and her very kind friends are having a tombola in the Harrogate Hospital Foyer on Thursday 27th September, to raise funds for us! Good luck to everyone, I hope the day is a success! 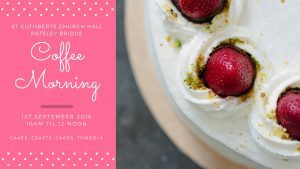 Our Pateley Bridge members have got together and organised a Coffee Morning in St Cuthbert’s Church Hall on Saturday 1st September 2018. It is free to enter and there will be a tombola, cakes, crafts and lots of company. Come along and find out more about Vision Support. UPDATE: Well done Pateley Bridge Members you raised a marvellous £293.95! 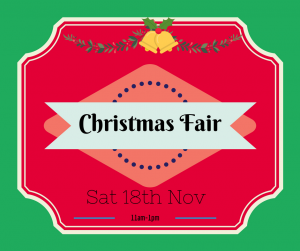 Crafts, cakes, cards, tombola, books & much more…. 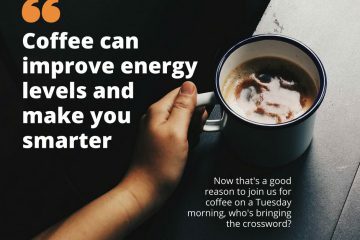 Come along and join us for coffee and a mince pie, £1.50 entry! Thursday 16th November in the foyer at Harrogate Hospital, we are having a tombola table, please pop along and buy some tickets and win a fabulous prize! 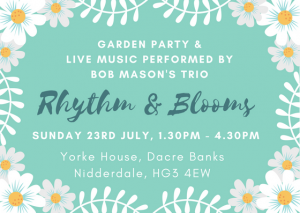 Everyone is welcome to enjoy Rhythms and Blooms, an Open Garden and Musical event, which will be held on Sunday 23th July 2017 from 1.30pm to 4.30pm in the beautiful gardens of Yorke House, Dacre Banks in Nidderdale. The event will be held in aid of Vision Support Harrogate District which provides invaluable support to local residents with impaired vision. This award-winning garden at Yorke House has extensive areas of flowering and foliage plants, water features which include ponds, stream and attractive waterside plantings and extensive views across the Nidderdale valley. Afternoon entertainment will be provided between 2:00pm and 4:00pm by Bob Masons Swing Time Trio who create a convivial atmosphere with their easy listening style of music. Come along and enjoy the relaxing music and the delightful garden, together with home-made teas served on the lawn. Visitors may also use the picnic area in the orchard. Most of the garden is accessible to visitors with disability. Dogs are welcome on a lead. Parking on-site. Admission fee is £5 for adults, children free. 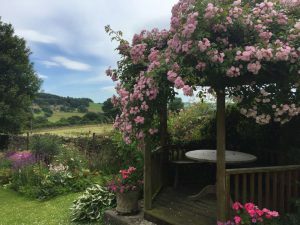 The garden at Yorke House HG3 4EW is located near the centre of Dacre Banks on the B6451, 10 miles NW of Harrogate, 10 miles N of Otley and 4 miles SE of Pateley Bridge, and will be clearly signed. Pat & Tony Hutchinson kindly open their gardens to raise money for us. We would like to thank Mr & Mrs Hutchinson for their continued support of our charity. Celebrating the life of John Metcalf more famously known as ‘Blind Jack of Knaresborough’. This year the whole community comes together to celebrate the 300th anniversary of John Metcalf’s birth and Vision Support is kicking off the celebrations with a fabulous Tea Party, savory and sweet treats washed down with tea and lively entertainment in the venue where John Metcalf played his fiddle when he was a boy, entertaining the masses. Tickets are priced at £17.50 and are available to buy at the Vision Support Centre, 23 East Parade Harrogate, HG1 5LF. Our regular annual event where our members have the opportunity to showcase and sell the wonderful arts and crafts they have created over the academic year. Cake, craft stalls, refreshments, bric-a-brac, a fabulous raffle, tombola, and more. A big THANK YOU to everyone who supported this year’s event; we raised an amazing £695.87 (and had a great time!). A local band, The Big C’mon, very kindly donated proceeds from a collection at their latest gig @ St Robert’s Club, Harrogate. We thank them very much for their donation and the staff and a volunteer had a fabulous evening listening and singing along to your brilliant music. This was a very short notice event but the band have said that they would collect for us again later in the year, so we will let everyone know next time so you can come along and enjoy the evening too! The band are on Facebook so take a look at their page! One of our fundraising members, Beryl Wood, is holding a tombola at the local hospital on Thursday 6th October 2016. This stall will not only be an opportunity to raise money, it is an opportunity for the Society to raise awareness of the ECLO (Eye Clinic Liaison Officer) service that we provide at the hospital and Mowbray Square Clinic. The ECLO service is vitally important in supporting people who are experiencing sight loss, it aims to signpost, refer, advice and support patients and their families. We wish Beryl and her helpers lots of success! This is Beryl’s second opportunity to raise funds for the Society. All the fabulous products that the members have made will be for sale at Harrogate Hospital in November. The date is to be confirmed. Thank you so much to the Doric Masonic Lodge, who have very kindly donated the proceeds of a raffle they had at a recent meeting. We are very grateful to you for your kind donation of £130! On Sunday 17th July, 1.30pm to 4.30pm. Pat & Tony Hutchinson kindly open their gardens to raise money for us. Visitors enjoy relaxing music from Bob Mason’s Swingtime Jazz Group and the tranquil garden setting. As well as tea and homemade cakes, plant and tombola stalls. £856.35 was raised this year many thanks to all those who supported and attended our event. We would like to thank Mr & Mrs Hutchinson for their continued support of our charity. Click here for link to Yorke House. 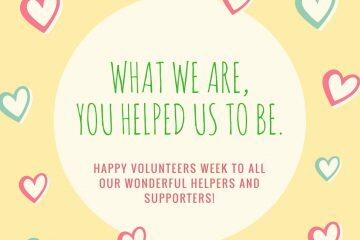 Thank You, Jenny Perkins and her marvelous team of helpers for all the hard work you put in! 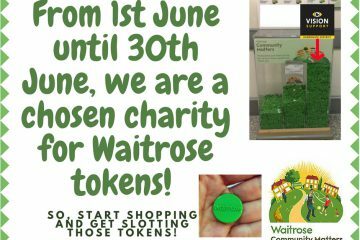 Over £600 was raised! Thank you Beryl Wood and friends for all your hard work. A very lovely tea it was too. £1066 was raised! We are extremely lucky and honored to have had two fantastic ladies, separately, running the London Marathon for us this year! Karen Kidd explains below why she ran to raise money for us at HDSB and Prostate Cancer. Well done Karen and many thanks from all your supporters at HDSB. Charlotte Mortimer explains below why she was running the Marathon for us at HDSB. So here goes it’s the big one! In less than 8 weeks I am going to attempt to run a marathon. I would like to raise money to help this local charity, as it supports so many visually impaired and blind people in and around Harrogate. My mum is registered blind and this charity has helped her in many ways. She is a volunteer at the centre. Telephone befriending is a way in which she helps support others and regularly rings people who might be lonely or restricted because of their sight. I know they look forward to the phone calls and it is vital that this service continues. We are so proud of you Charlotte, and Pauline would be too! from all your friends at HDSB. Steve Cobb is taking on the Nidderdale Walk on Saturday 7th May to raise funds for us here at HDSB. Steve is a volunteer in our pottery class and our walking group. We are very grateful to you Steve, since I know that by the time you have completed the walk; you will actually have done it 3 times this past couple of weeks! Good luck Steve! The sponsor sheet is in the office for those who would like to support Steve. Any donations of delicious cakes, biscuits, tray bakes, scones, flapjack etc… Would be very gratefully received. Tanya and the Vision Support Team!